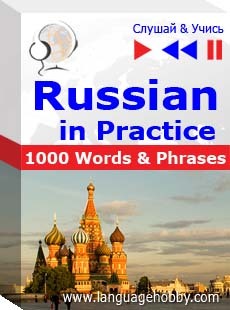 Listen to "Russian in Practice" on your iOS and Android device. This is an audio course for learning by listening, which in an easy way teaches the basic vocabulary needed for a journey abroad. The course includes 20 lessons which introduce and consolidate the most important words and expressions used in typical situations and there is an additional part which includes the teaching of numbers, time expressions, telling the time, words describing people's characteristics, the family and other subjects. The course is designed for people beginning to learn Russian and for those wishing to remind themselves of the basics of the vocabulary needed for a journey abroad. repetition of example sentences and questions in various situations. 21. Useful words. Numbers. Days of the week. Months. Seasons. Countries and nationalities. Members of your family. Professions. Time expressions. Telling the time. The weather. Parts of the body. Features of character.